Got Beat Detective? Now get the best training! 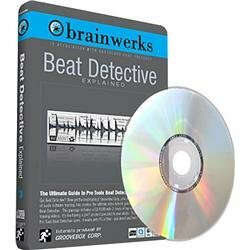 this is the ultimate video tutorial guide for Digidesign's Pro Tools' Beat Detective. Learn how to cut and quantize you drum recordings and files! This package includes a CD-ROM with 2 hours of top-notch, in-depth, well paced training videos. It's like having a 24/7 product specialist in your studio. This product is ideal for all Pro Tools Beat Detective users. It works with PC or Mac - just insert and learn!